Have a family camping holiday to remember at our luxury camping site, nestled in a green valley among the mountains of the Alpes-de-Haute-Provence. Explore pretty Alpine villages, lakes, and countryside, and spend your nights in camping luxury in one of our mobile homes. Give LUX-camp a call for more information and to book. 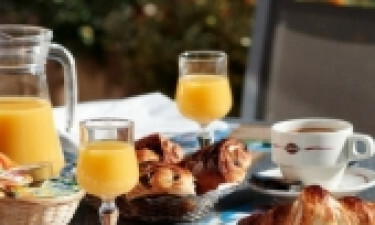 Why camp at Domaine de Verdon? 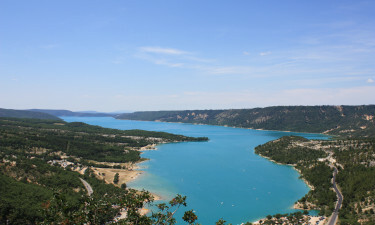 The key tourist attraction in this area is the Gorges de Verdon, a series of canyons carved out by the river. There are also two large lakes, perfect for a stroll or picnic on the bank, while the more energetic can swim or hire a boat. Tours and hiking trails bring you to marvellous views, and the green slopes of the majestic mountains are always in sight. We pride ourselves on the family atmosphere of our luxury camping site. There are plenty of activities that the whole family can enjoy together, and our hiking tours are suitable for all ages and abilities. We have mobile homes and facilities specially adapted for disabled guests, and the paths around the campsite are suitable for wheelchairs and mobility scooters. In the summer evenings, we offer entertainment on our restaurant terrace for children and adults too, like karaoke and talent shows, but we make sure everything's quiet by bedtime. As well as luxury camping, we offer you plenty of activities to fill your day. There's an indoor games room for wet days, and a swimming pool where we run a variety of classes including aquarobics and children's swimming lessons. Kids can enjoy games, crafts, and entertainment in the daytime and evening, and they'll love our two bouncy castles. 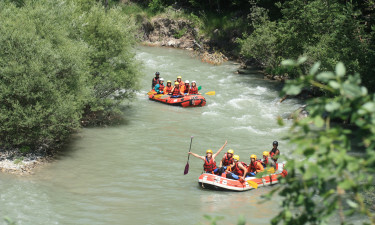 Beyond the campsite, we can help you book on to activities like rafting and paragliding in this stunning landscape, or exploring the treetops on a high ropes course. For a change of pace, spend time in the museums of Castellane. This region is famous for its gastronomic specialities. Try them out at our pretty restaurant, with room for big or small groups both inside and out of doors on the terrace, where you can also take advantage of the complimentary wi-fi. For a quick snack, like pizza or chips, there's the takeaway restaurant, and in high season our two bars near the pool serve hot and cold drinks and ice cream throughout the day. Our on site supermarket opens early in the morning, offering freshly baked bread for breakfast, and stays open until the evening. With a wide range of great products to choose from, it's the place to pick up day to day supplies, regional treats, and souvenirs.